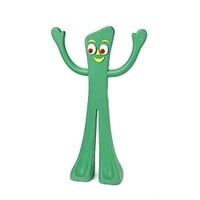 Gumby® is flexible and durable which make him the perfect toy for your pet and nostalgic pet owner. Now your pet can enjoy his company and be entertained as well, with every toss, tug and pull. 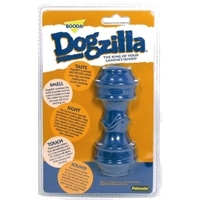 Dogzilla® rubber toys are the King of your Canine’s Senses. 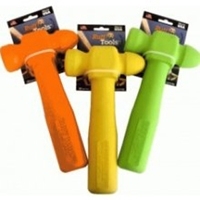 Created from durable rubber designed to appeal to your dog’s 5 senses, these boredom-busting toys are a great way for your dog to release energy, exercise and stay mentally stimulated. 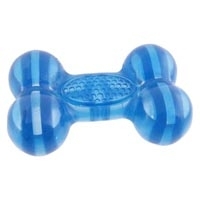 Great for heavy chewers and parent-pet interaction, Dogzilla has the right taste, color, smell and shape for your dog. 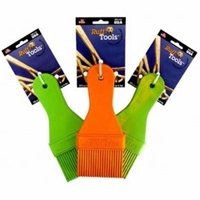 Available in a variety of sizes and shapes, perfect for any canine! 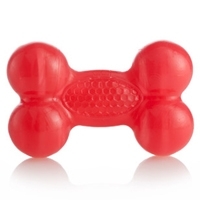 `Dogzilla® rubber toys are the King of your Canine’s Senses. 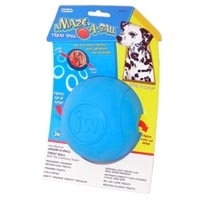 Created from durable rubber designed to appeal to your dog’s 5 senses, these boredom-busting toys are a great way for your dog to release energy, exercise and stay mentally stimulated. 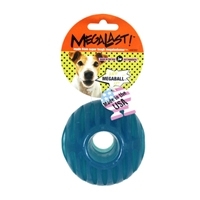 Great for heavy chewers and parent-pet interaction, Dogzilla has the right taste, color, smell and shape for your dog. 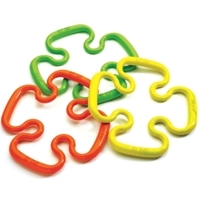 Available in a variety of sizes and shapes, perfect for any canine! Never throw a rock for your dog to chase — unless it’s The Rock from Ruff Dawg. 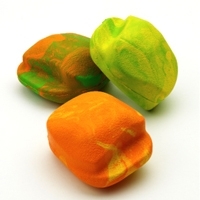 The Rock is a rubber dog toy that you throw like a rock and watch it bounce in all directions. 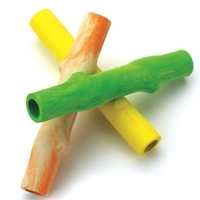 These unique interactive durable dog toys are a great way to keep your dog exercised and a great way to enjoy a new twist on fetch. 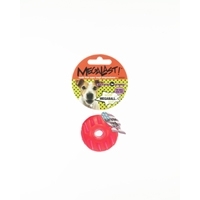 The Megalast Bone is a tough flexible bone made of Megalastomer, our durable TPR, Thermo Plastic Rubber. These Made-In-USA toys are infused with vanilla and are available in three assorted bright colors and can be filled with treats. They’re mega strong, mega bouncy and mega fun. 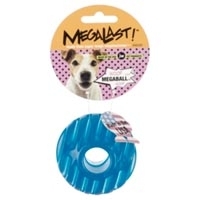 Our big idea with the Megalast Ball is that it’s made in the USA with innovative, tough Megalastomer, our TPR, Thermo Plastic Rubber. And more than just mega-durable and mega-bouncy, it can even float. Plus, you can fill it with treats. 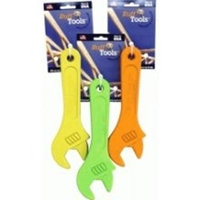 Available in three bright assorted colors. 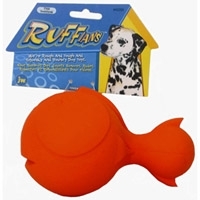 The Ruffians Fish is a part of our squeaky rough N tough Ruffians line. This friendly fish made from durable natural rubber will get along swimmingly with your dog providing hours of long lasting interactive fun. The Fish's squeaker produces an engaging squeaky sound your dog will want to hear over and over again. 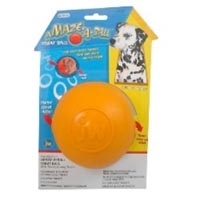 This bouncy fetch and chew toy is geared towards medium and large breed dogs. The notion of a rubber chicken is funny by itself. Make it real, natural rubber, add a squeaker designed so it can’t fall out, and you’ve got a dog toy that’ll make everyone happy. 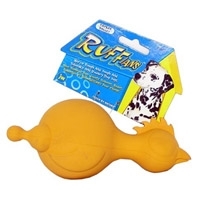 It’s one member of our rough and tough Ruffian’s line of incredibly durable dog toys. 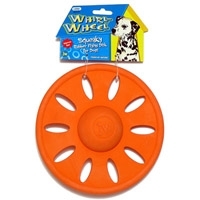 The Whirlwheel is a fun flying disk with a tough squeaker in the center. 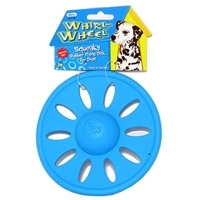 This natural rubber wheel is floppy and flexible, easy for dogs to pick up and catch. It is a tug, a chew, a teether and flying toy with a novel twist, the squeak. This toy does it all. 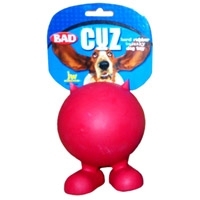 The Good Cuz is an ingeniously designed, durable natural rubber ball with feet. But that’s not the only inventive thing about it. The squeaker that’s built into the Good Cuz is designed so it won’t fall out. 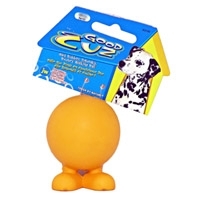 As part of our iconic top-selling Cuz line of toys, the Good Cuz will become your dog’s new best friend.